This is a CBB61 1.5uf+3uf 3 WIRE capacitor ± 5%, 250V AC and 50/60Hz rating. The maximum operating temperature is +70°C. Before throwing away your favorite ceiling fan check the CBB61 ceiling fan capacitor first. It may be weak or burnt out. 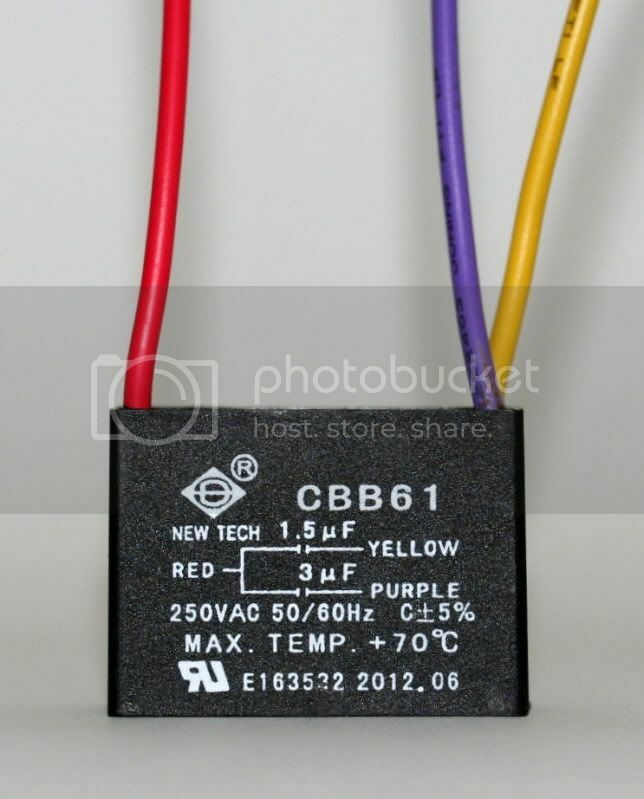 CBB61 capacitors control the start and stop mechanisms and fan speeds on many different types of ceiling fans motors using these types of capacitors. Q: I cannot find the exact capacitor anywhere. Can you please help? A: We carry 5000 plus capacitors at any given time in stock. Email us and we will try our best to help you. Q: My old capacitor voltage is 450V and your capacitor says 250V. Will it matter? A: For USA and Canadian household fans the capacitor voltage of 250V is more than enough. Q: Do the color of the wires need to match my old and new capacitor? A: Color of the wires do not matter but the uf ratings does.